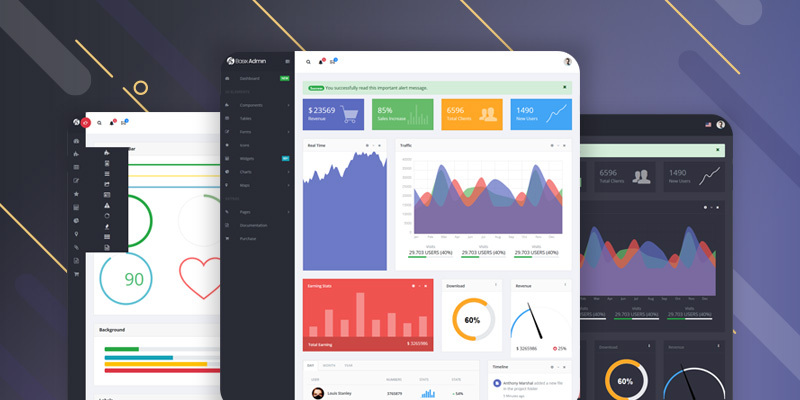 Basix admin is a free as well as beautiful dashboard template built by Vue.js and Bootstrap. It is registered under an MIT license. 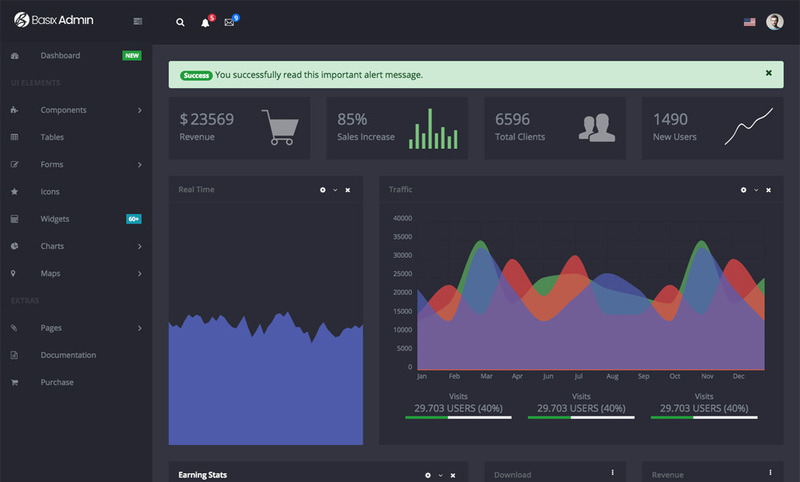 It has 60+ widgets and 2000+ free icons which serve you all kind of flexibility to build a nice admin panel. It has all the necessary components which help you to make any type of admin panel. 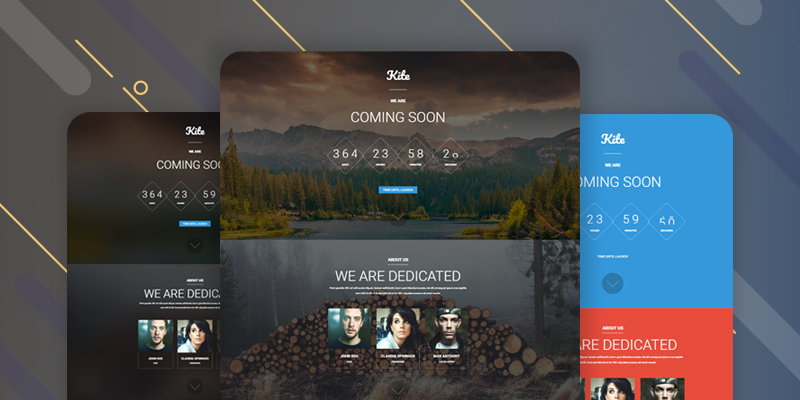 60+ widgets in this template give you a full flexibility to create any kind of design as per your choice. Customization is very easy like Dropdown, divider, Badges etc. You can add/remove the menu items from nav.js. We have set Navigation as a component so, you need to open any file. Everything you need is on nav.js. It has 80+ component variations which help you to rich your dashboard to a new level. 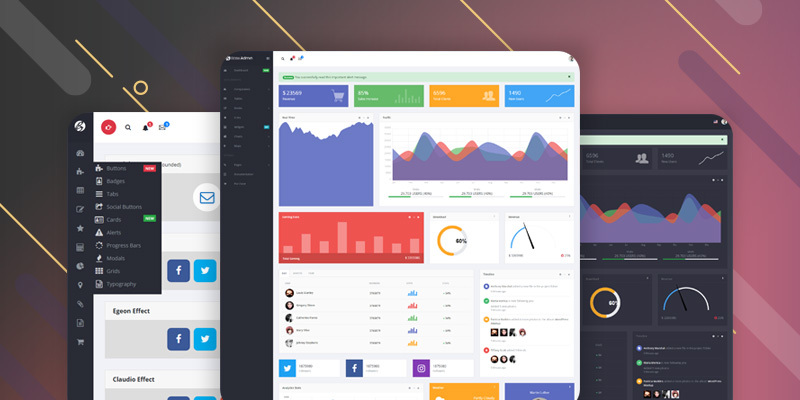 Basix admin template is full of features that will help you create websites in an easy way. You can access 2000+ like Fontawesome, Brandico, Entypo, Fontelico, Glyphicons, Iconic Stroke, Ionicons, Maki, OpenWeb Icons etc. Advanced Google Map integration is enabled in this template that will help to set your desired design very easily. As it is powered VueJS the loading time of this template is fast. It is very easy to customize. A single file can create a menu list. You will get a notification for an update in the GitHub repository. If you are looking the pro version, there is also an option available for that. Built with SCSS- SCSS files included. Completely Modular! Every Single Element as its own module. Basix is a clean, lightweight, natural looking and minimal admin panel. It uses the bootstrap framework ensuring great quality and nice user browsing experience. Vue JS is used along with nesting routers and views. It is made up HTML and CSS3 W3c valid code. It can be modifiable into anything you might want. It is well suited for a web application, admin dashboard, user dashboard and much more. Basix is a highly innovative and technically refined admin panel. It has tons of pre-made pages and components that will help you to create to any type of admin panel as you need. The refined admin template offer you to create, develop and maintain the graphically mature and a functional website of high quality. Tons of pre-made pages and components integration help you to create your desired admin dashboard. The pro version of this template has some pre-design layouts, each of them with a unique and interesting style. As this template incorporates with Live charts, Forms and Maps this will help your site or application’s capabilities to expand. 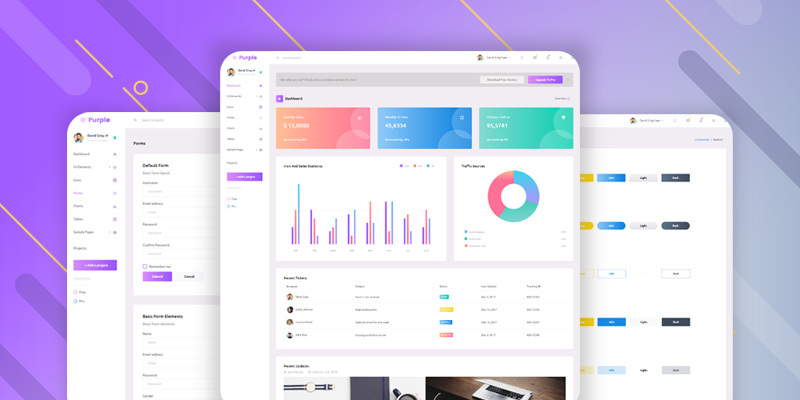 It has smooth reporting feature like in-house developed charts, Forms and other widget and elements that will make the task easier which ultimately produce a business or corporate-friendly admin panel. 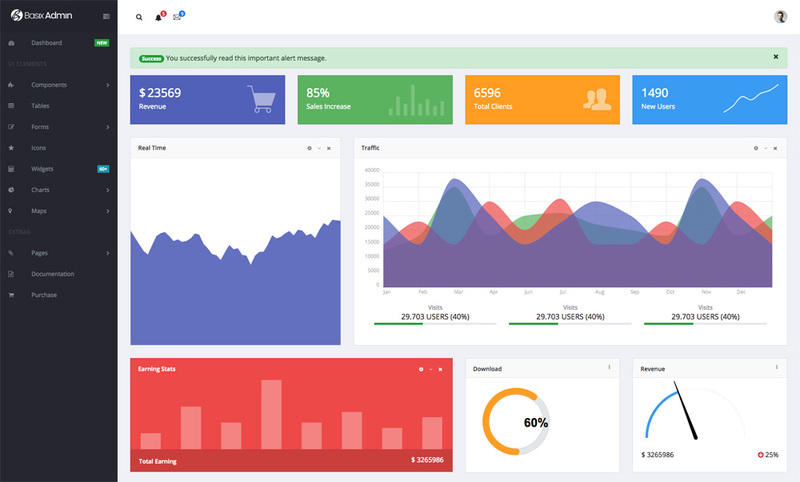 Basix is the professional Bootstrap admin template for people those serious about presenting results in the best way. Basix is powered by jQuery and it features 2000+ beautiful font icons, each of them has its own unique style. 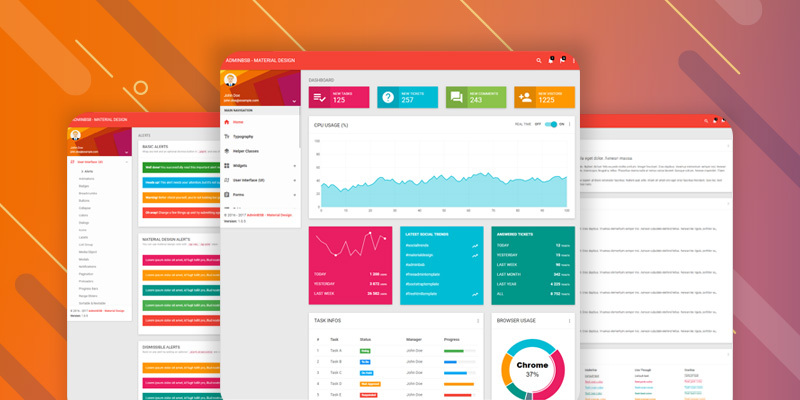 It is not just an admin panel, it’s an all in one to develop your personal admin dashboard. 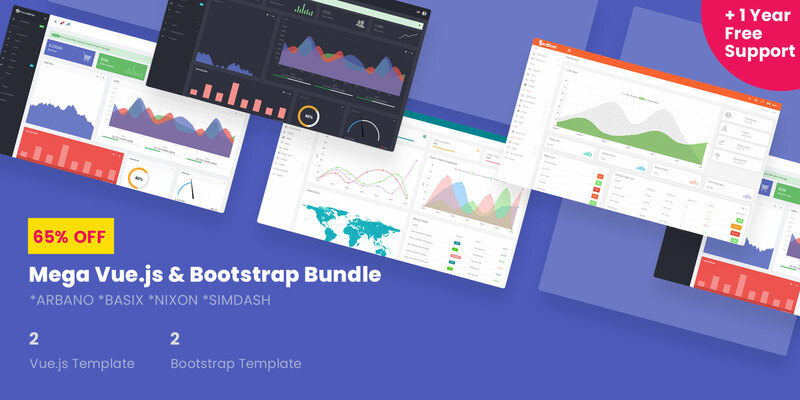 These products include 60+ widgets, 2000+ fonts icons, live charts, forms, maps etc. Basically, it can fit your desired niche. Why Use Basix Admin Template Made Of Vue JS? Vuejs is a progressive framework that is used to build the user interface. Let’s we discuss some of advantageous of Vue JS. The size of VueJs is lies between 18-21 KB which is very small. It takes very little time for downloading. This is one of the biggest advantages of VueJs its small size. One other advantage of this framework is it is easy to comprehend and you can integrate it into your web projects. Both the simple and complex template can be built with the help of this framework. The admin theme is really awesome !!! I really like the admin theme, it is really good and very easy to customizable.